Click on a topic to see the recommended websites. Find out about the festival of Diwali, India's most important holiday. Watch a video clip about how Diwali is celebrated in India. See Diwali celebrations at the Golden Temple in Amritsar, India. Watch schoolchildren in India making rangoli designs for a competition. See how little clay lamps are made for Diwali. The story of Diwali, the Indian festival of lights, from its beginnings in Hindu and Sikh tradition to how it is celebrated today. The Usborne Reading Programme has been developed with reading experts from Roehampton University. Young Reading Series 2 is designed for children growing in reading confidence and ability. With internet links to recommended websites to find out more. 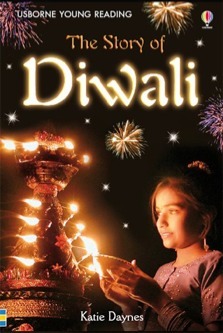 Every year, bright lights, family gatherings and street parades mark the spectacular festival of Diwali. But how did the festival begin? And who celebrates it today?